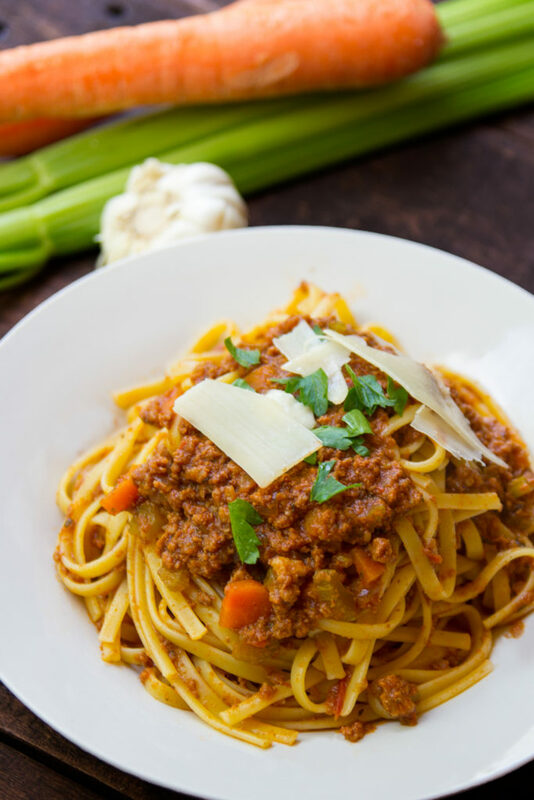 AMAZING Instant Pot Bolognese Sauce Recipe | Fast, Easy, & Delicious! 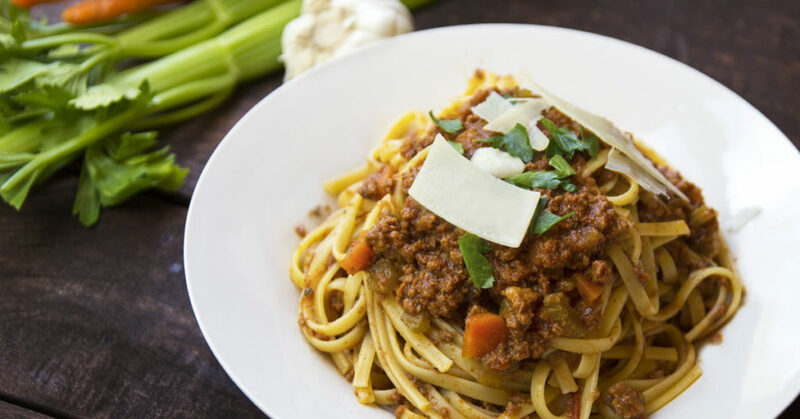 What is better than a rib-sticking, hearty, complexly flavored bolognese? 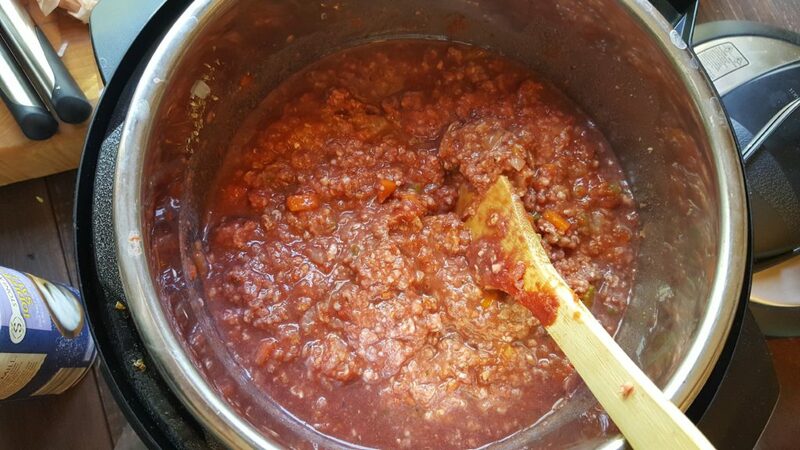 How about when it's an Instant Pot Bolognese Sauce Recipe that will take literally 45 minutes from start to finish? And most of that time is spend cooking in the Instant Pot, so you don't have to do anything. Too good to be true? Nope. 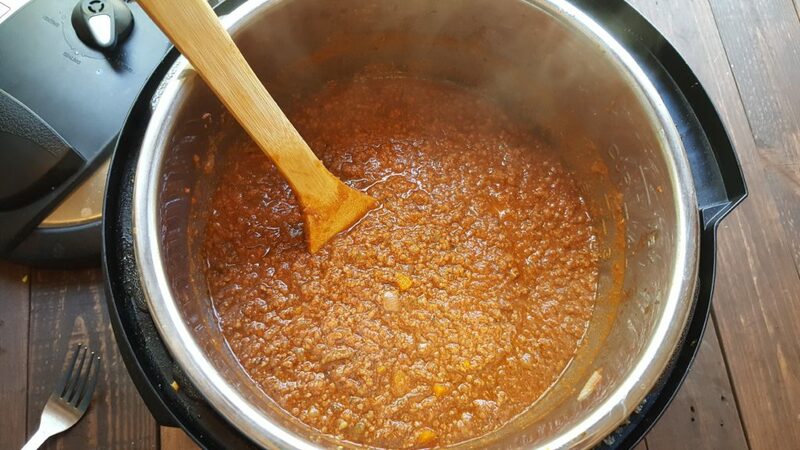 You've got to give this Instant Pot Bolognese Sauce Recipe a try. It's meaty (as a bolognese should be) and just coats the pasta so well. And whether you use a slow cooker or the Instant Pot, the meat cooks to the point where the sauce is almost velvety. The cool thing is that while these directions will tell you to saute the vegetables, you don't really have to. This recipe could be a great dump recipe. 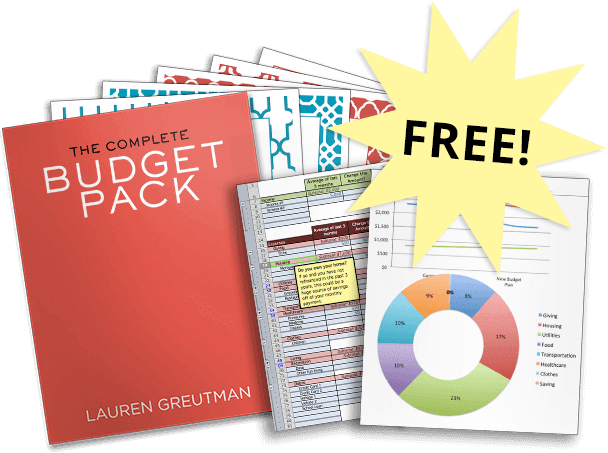 You can just put all the ingredients in together either the Instant Pot, a Slow Cooker, or a freezer bag to be used for later. 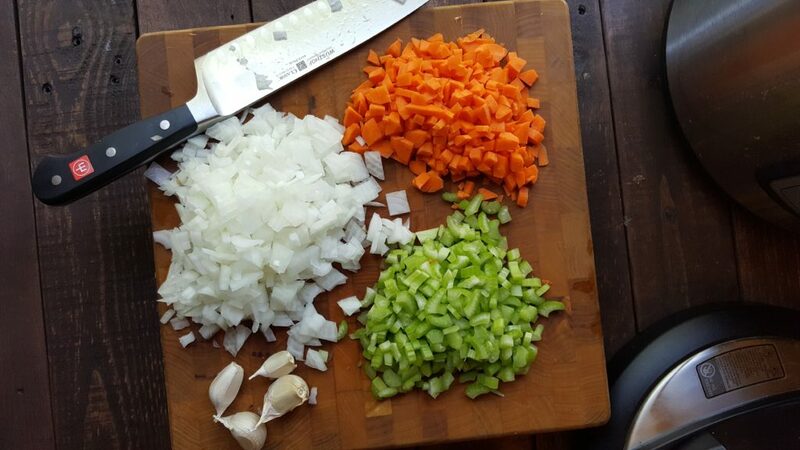 The hardest part of this entire recipe is chopping the vegetables. You're gonna want them pretty small… no one like big chunks of carrot in their sauce, right? Turn the Instant Pot to saute, add some oil. Once it's hot, toss in the chopped vegetables. Saute them for 5 minutes or so. Then add the tomato paste and spices. Mix it up until well blended. Then add everything else. Yup – just put the ground beef in completely raw – no pre-cooking necessary. However, you don't want to end up with big hunks of cooked hamburger in your sauce, so it's very important to mix up everything really well at this step. Break up all the hamburger until you have a pretty homogenous mixture. Then turn the Instant Pot to the Meat/Stew setting and cook for 30-40 minutes. Once it's done and it depressurizes, you will notice that there will be fat from the hamburger boiling on top. But don't scrape it off. You want this fat in the sauce! It's part of what makes bolognese so good. So mix it all in. Take a few minutes and stir the sauce while it's still bubbling a bit. The fat will mix back in the sauce nicely. After the vegetables are chopped, add olive oil to the instant pot and toss in the onions, celery, carrots, and garlic. Add the tomato paste and all the spices. Blend well. Mix everything really well, making sure to completely break up the ground beef. Set to Meat/Stew setting for 35 minutes. Close the lid. After it's done, let it naturally depressurize for about 5 minutes. Remove the lid and stir well for about 5 minutes. 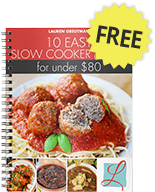 Can the Instant Pot Bolognese Sauce be made in a slow cooker? 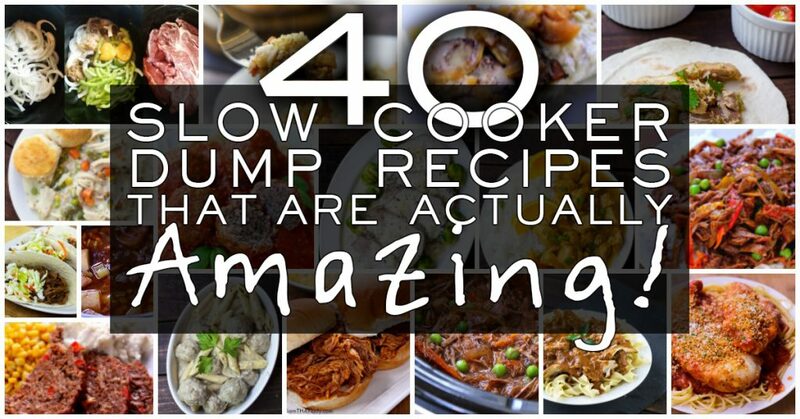 Braising, Stewing, Pressure Cooking and Slow Cooking are all pretty much interchangable. That sauce looks delicious. It’s decided! I am making this one on Saturday evening! DELICIOUS. I always drained the fat after browning but no more. Recipe is easy and does not have ingredients that are foreign or you will never use again in another recipe. I will keep this recipe and use again and again. Thanks for sharing your recipe! Lauren, will this recipe fit in the mini duo 3 qt? If not, would a pound of spaghetti be easily cook d in the mini. I have a IPdou 6 qt also. It’s in my IP right now. Used my food processor to chop the veggies. Added 2 tbsp dried parsley because Its my habit. Very easy and speedy receipe. I am sorry but this is a terrible recipe resulting in mush. Even with the IP, browning and caramelization of meat is clearly a must. Am new to this way of cooking so thought I would give it a try. I wasted 2lbs of ground beef and San Marzano tomatoes. In addition, 35 minutes of cooking time is far too much. Just giving some constructive feedback. Delicious, no, unbelievably delicious. I only used 1lb of meat. Can I cook the noodles with it next time? Pretty good. However, thyme was a bit overwhelming. Probably should have used 1/2 tsp. thyme max. How much pasta would you make for this recipe? Just made it. followed the instructions to a t. Awesome!! dice 4 oz pancetta and add to hot pot and olive oil until it starts to crisp. Then add veggies, and salt and pepper and saute until soft and deglaze with 1/2 cup of red wine. This will actually reduce down to almost nothing and cook off the alcohol flavor if you add it at this stage. Add the herbs, stir in for a minute or two until they start to get fragrant. Add the ground beef and chop it up until it’s the texture you like (does not have to brown as recipe says). Add the rest of the liquid and use 1 cup of beef stock (because you’ve evaporated off most of the wine liquid). I also sometimes use half ground sirloin/half ground pork. I’ve made it both with and without pancetta but really prefer adding the wine early when the pot is still empty and quite hot either way. It does add a few more minutes of pre-pressure cooking time to the prep but it makes an already great recipe even better. To the guy who thought it was terrible, I’m not sure what you did but mine came out awesome even following as written… the wine alcohol flavor was more pronounced than I liked but over spaghetti squash with freshly grated cheese it was still excellent. With a few tweaks it’s out of the park. 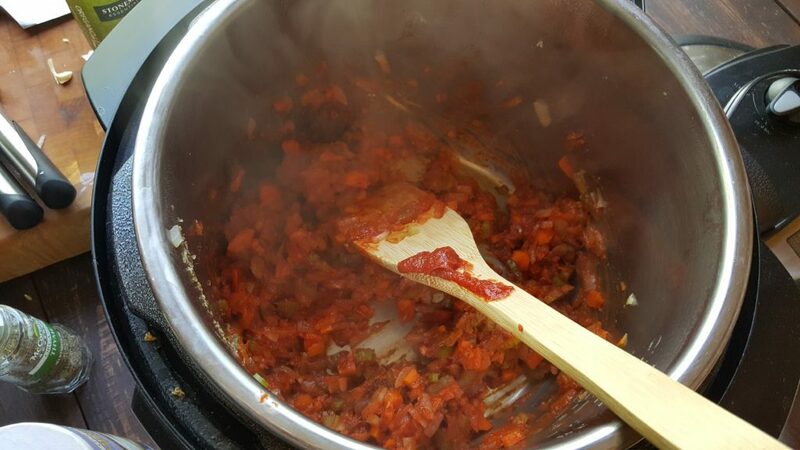 Not sure what you did to get mush but bolognese is a long and slow cooked ragu so stovetop takes 3 hours… 35 minutes is perfect in the IP and the maillard reaction that occurs means you don’t have to brown ground beef before cooking in the IP. Very good recipe. Very traditional. More meaty than tomatoey. We made the this exactly as written so we could review it properly. No complaints, however the sauce seemed a bit bland for our taste. Perhaps we will try it with Pancetta next time or more seasonings. But the recipe is worthy. Made this dish and used meatloaf mix (ground beef, pork and veal). I did brown the meat a bit on saute mode before following the rest of the instructions. The dish came out so delicious and I will definitely make again. Just as good, reheated two days later. Thank you!